Citation Information: J Clin Invest. 2006;116(5):1360-1370. https://doi.org/10.1172/JCI27030. 2H6 TCR transgene expression and phenotypic analysis of the transgenic mice. (A) Expression of 2H6 TCR transgene. Thymocytes, splenocytes, and lymphocytes isolated from pancreatic and axillary lymph nodes (PLNs and ALNs, respectively) of 2H6 TCR transgenic (line 50) and nontransgenic NOD mice were stained with anti-Vβ14, anti-CD4, anti-CD8, and a cocktail of anti-Vα mAbs and analyzed by flow cytometry. The numbers in quadrants represent the percentage of positive cells among the total cells analyzed. 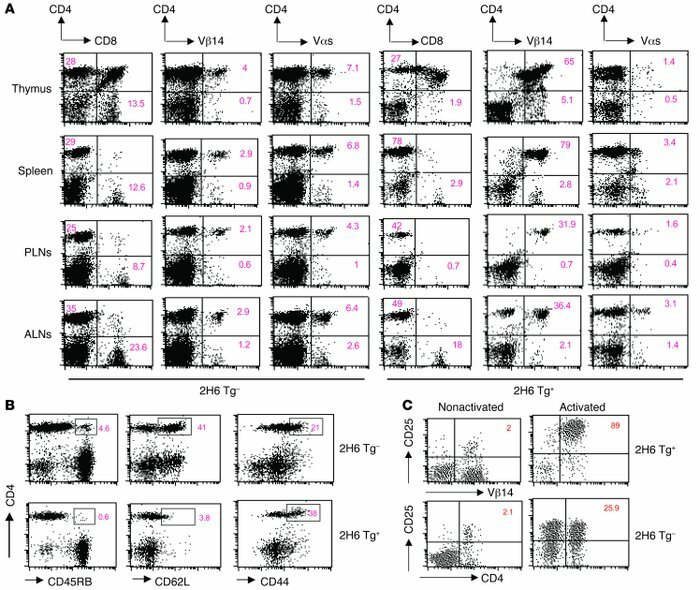 (B) 2H6 transgenic T cells express an effector/memory–like phenotype. Lymphocytes isolated from spleen of nontransgenic (top panel) and 2H6 TCR transgenic (bottom panel) NOD mice were stained with CD4, CD45RB, CD62L, and CD44. The cells were then analyzed by flow cytometry. (C) CD25 expression of splenic CD4+ T cells in 2H6 TCR transgene-positive and -negative NOD mice. Splenocytes were harvested from both types of mice and stained with CD4 and CD25 with and without anti-CD3 stimulation. The numbers in the top right quadrants represent the percentage of positive cells among the total cells analyzed.